This is one of my favorite sites too. I love the way they can mash-up the best combinations of characters and created a cover that really draws me into the story inside. 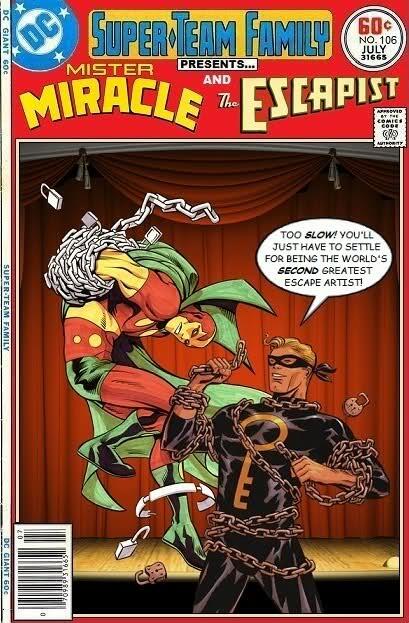 Love 'The Escapist' and the comics that came out after 'Cavalier...' And how can you do better than Mr Miracle, greatest escape artist of three worlds. How can you love the connection bettween the character and how he was created. Kirby based MM on Steranko who was at one time an escape artist. Yup... my man Ross does a great job thinking it all out!! !